Goblin Valley State Park, UT – we’re here on the advice of a guy at our neighborhood hardware store in Grand Rapids, where we spend lots of our time (and money). “There’s nowhere like it – completely unique”, he promised. Maybe we’re wrung out with the magnificence of the National Parks we’ve visited in the past weeks, but our general feeling is “meh”. It’s all right, but just not up to the scale to which we’ve become accustomed. How spoiled can two Michigan kids get? 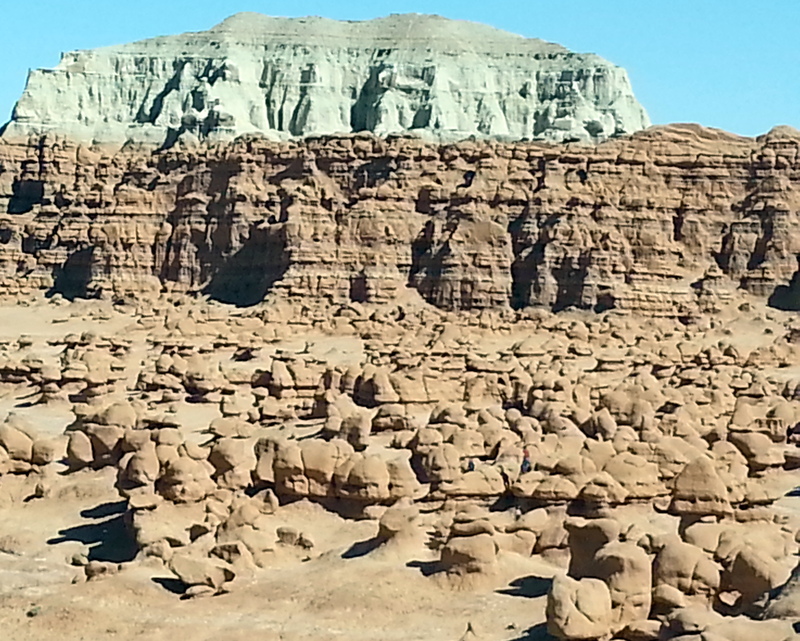 The attraction of Goblin Valley is the curious landscape of ground-down sandstone rocks from the San Rafael Swell. The entire valley looks like some kind of Devil’s chessboard. What’s unique is that these structures are unprotected, and you can climb, scramble, and walk anywhere you want. That’s so rare. Because many of these rocks are munchkin-sized, it’s a kids’ paradise. It’s crawling (literally) with kids. Every campsite has at least five kids. The campground itself is pretty nice, with about 25 campsites, each with a sheltered picnic table and fire ring. No services, but flush toilets and a few really lame showers. Our neighbors are a gang of boy scouts of the age where they have these really LOUD, excited voices, and Generator Man, who constantly powers up his rig. Why? There’s no phone, radio, or TV anywhere for miles. We can’t quite figure it out. 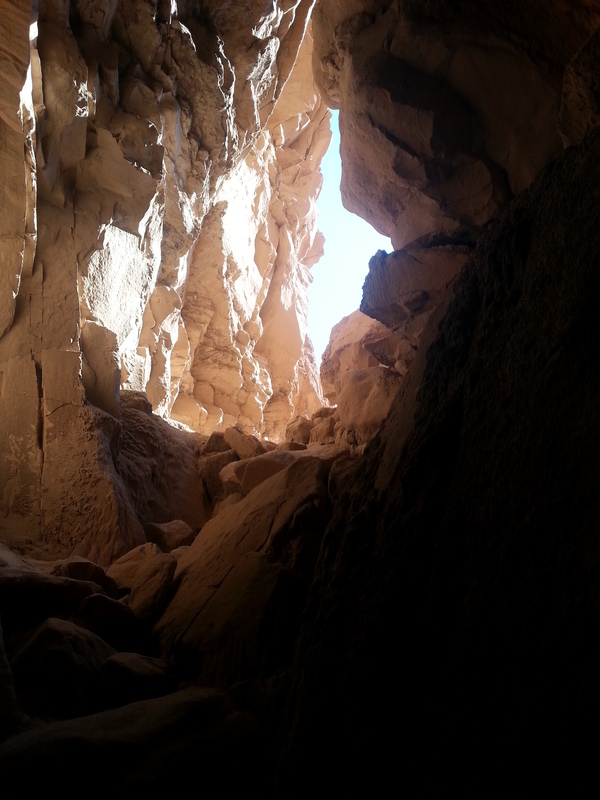 We did hike a bit, exploring a cave called Goblin’s Lair, which tested our scrambling abilities. Apparently, we’re neither as brave, nor as limber as we think we are, as there were a few nervous moments. On the way back, we passed families heading out to the same spot with their dogs and three-year olds. Really? 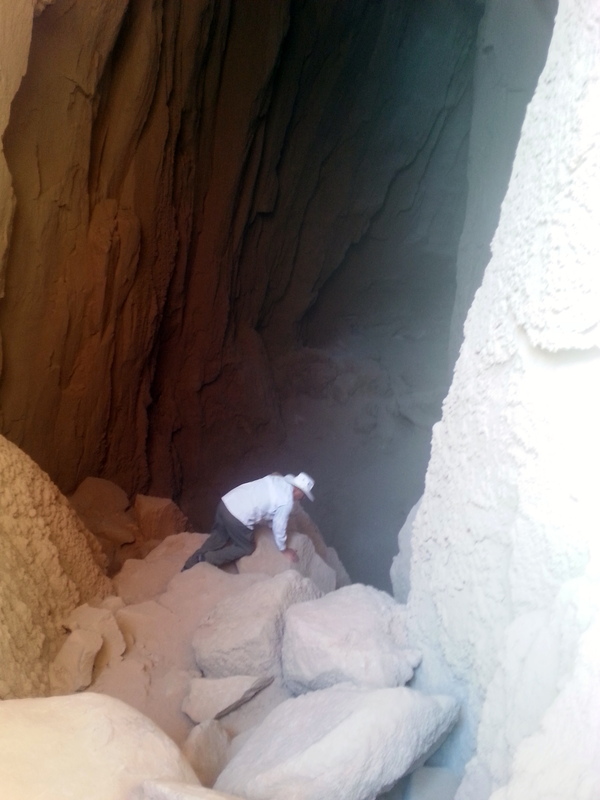 Bet most of them turned back before getting into the cave – there sure are better family hikes than this one. Evil winds wracked the campground this afternoon, so we hunkered down with books and naps. It was nice to do nothing. As much as I like to think that we are superoutpeople, I’m just tired. Nice to just goof off for an afternoon. By the time anyone reads this, you’ll probably know the results, but GO SPARTANS! We sit in the Firetruck and listen to tiny bits of the basketball games on our satellite radio, hoping to cheer MSU on. The Fireball radio is nothing but static, so the truck is all we’ve got for connetions to the outside world. Pathetic, in a really funny sort of way, as neither of us are basketball fans at all. It’s hard, for me especially, to be separated from the news. We’ve been 10 days without cell service, stopping only once for an hour (doing laundry), when we could update the blog and check email and make a few quick phone calls. That’s tough. Tomorrow we’re heading to Dead Horse Point State Park, near Canyonlands NP. We’re hoping for more superb hiking – we’re amazed at how many miles we’ve put on our boots in the last month. 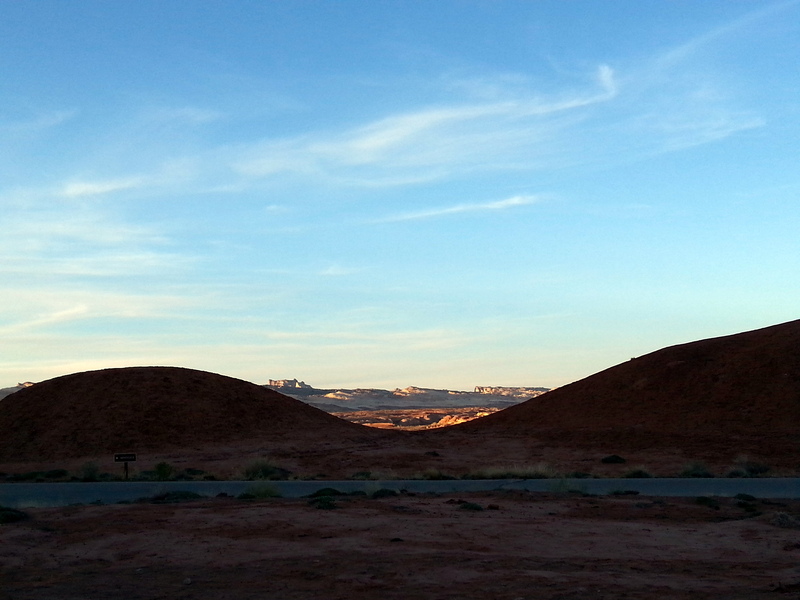 Then on to Arches NP. Hoping that we can find a decent grocery resupply spot between here and there. John had to bake bread, dutch oven style, this afternoon, because we had used up the last scraps of the stuff we purchased in Salt Lake City, over a week ago. All our fun food is gone, and we’re reduced to eating dregs from the larder. Backcountry Utah is no place for a couple of food snobs with limited storage space. I’m posting this from a parking lot at a grocery store in Moab. Every car we’ve passed on the road has one or two mountain bikes atop. It’s an outdoor paradise here – skydiving, zip lines, biking, rafting. We’re in for six days of big fun. 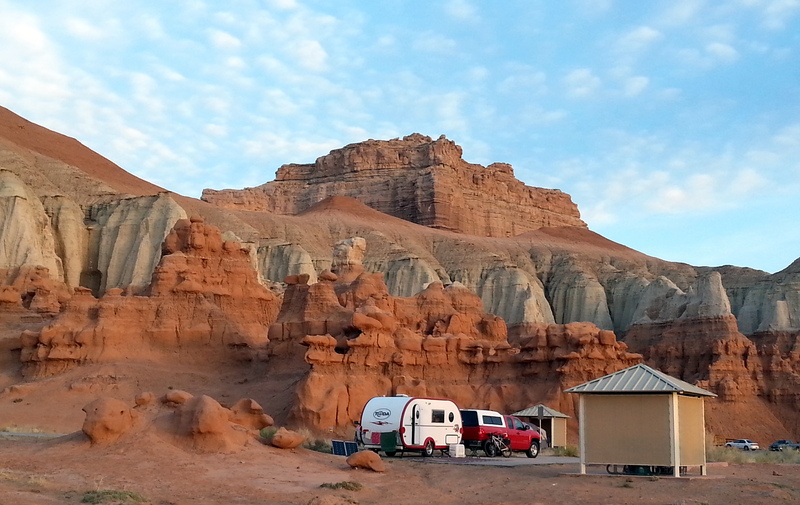 This entry was posted in camping, great outdoors, hiking, national parks, retirement, RV life, simple camping, state parks, Utah and tagged camping, food, hiking, national parks, road trip, RV life, simple camping, state parks, T@DA, Utah by Judy Crankshaw. Bookmark the permalink. That picture of Fireball below the goblins is beautiful and super sharp! I lost my camera last year, so all photos are with my Samsung Galaxy 3 smartphone. The lighting when I took that shot was great. The scenery does look a bit blah after some of the photos you’ve posted, but every one needs a break now and then. Maybe Generator Man fires it up to drown out the boy scouts? John was all set to go over and give him a solar sermom.! Opened your post on my phone…which often does not cooperate. 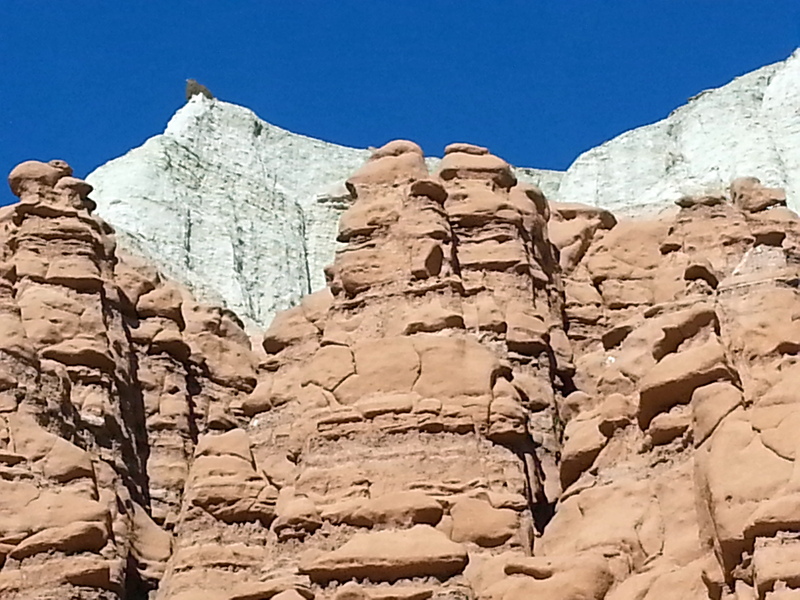 My first thought was of the hoo doos at Bryce NP. So I was pleased when I finally read that the picture was from Utah. It’s natural to become un impressed when all one sees is beauty. We got that way coming back from Alaska. Enjoy Moab and be careful! For some reason, we didn’t plan Bryce into our plans this year. Think we were too uncertain about altitude/weather. Now, we know enough to just do it, and tough out the cold as it comes. Our big deal now in Moab is the wind. We’ve got 55mph gusts, and are really getting bullied around. The Fireball is filled with rest dust – sifting in everywhere! I love those goblins. The structures look like dozens of goblin faces to me. You are storing up so many beautiful memories. Enjoy every minute. And keep sending those blogs. I’m living vicariously through you. Will send what we can! Goblins actually looked much better than my photos show. love your daily almost reports, all I can say is enjoy, you will be very happy to have done this trip and hope you have many more. I think I am getting a trike, as falling for me will be the end riding.